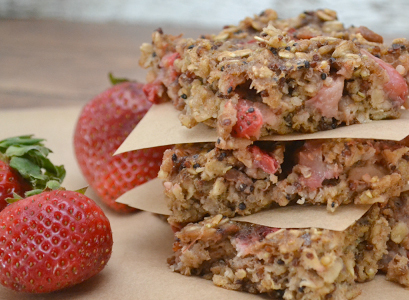 A delicious recipe for Strawberry Quinoa Breakfast Bars from Building Our Story. 1. Preheat oven to 350 degrees and prepare a large baking pan by lining it with parchment paper. 2. 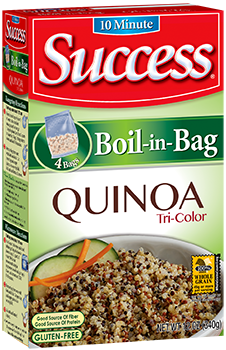 Prepare the bag Success® Quinoa as directed on the box. 3. 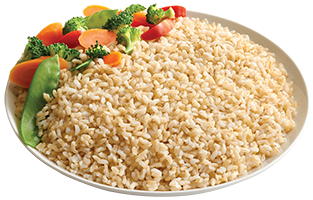 While Success® Quinoa is boiling begin combining all of the dry ingredients in a large mixing bowl. 4. Dry ingredients include: oats, sugar, cinnamon, baking powder, and pecans. 5. In a small mixing bowl combine the mashed bananas, egg, butter and honey. Whisk together until completely combined. 6. Drain the prepared quinoa and add to the "dry ingredient" bowl and mix together. 7. Carefully pour the wet ingredients into the oats and quinoa mixing bowl and mix everything together completely. 8. Fold in strawberries. Batter should not be runny! 9. Transfer the batter into the prepared pan and smooth with a spatula. 10. Bake bars for 35 minutes at 350 degrees. 11. Let cool completely before cutting into squares. 12. Enjoy immediately or keep in an airtight container.